I was talking with the VP sales with a prospect recently, asking how they managed their funnel. His answer struck me as I realized that his thought process is both very common, and a core reason for the lack of alignment between sales and marketing, as well as a major barrier to creating predictable, sustainable and scalable sales growth. His response to me was, “It depends which funnel you’re talking about.” He then went on to explain how they viewed their “marketing” funnel and their “sales” funnel. “NO! !” I thought. That’s the problem. You can’t have two funnels. To create predictable sales growth you must fully integrate and align your marketing and sales functions to create one seamless, holistic process. Unmanaged, there is a major chasm between the marketing and sales functions. This is especially true when dealing with the complex sale that is typically associated with B2B sales. The fundamental problem is that marketing tends to end their job too early and sales picks up things too late. The crucial link between what most people think of as marketing and sales is missing, and the only way to ensure that it’s not missing for you is to unify the funnel. Salespeople, on the other hand, tend to view leads through the singular prism of what I like to call “order-ready leads.” In their world the only good lead is one who has the PO number ready when the salesperson makes their initial call. Only 25% of leads you create will be purchasing within the next 12 months; 75% need to be nurtured and developed. As a side note, just because they’re going to buy something in the next 12 months, doesn’t mean they’re ready to buy from you. Between 71-89% of the traffic you get to your website isn’t thinking about buying anything. They simply trying to find helpful information to answer a question or to an address a problem. 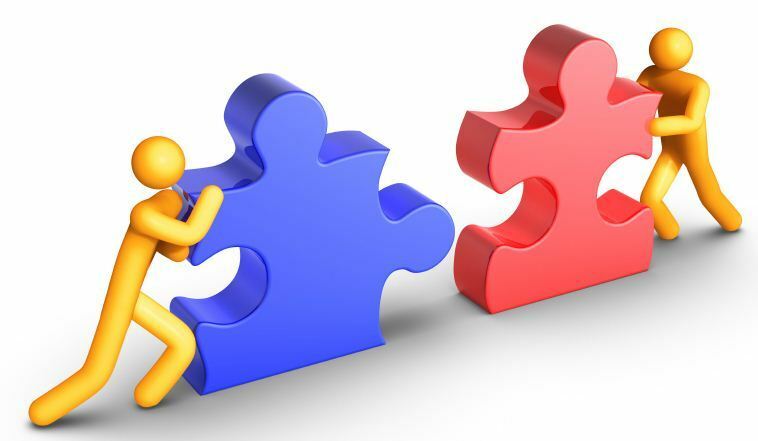 If your sales and marketing processes aren’t fully aligned and integrated, you’ll miss the highest value opportunities out there – those that haven’t already decided what they want. A study done by The Aberdeen Group found that companies that had highly aligned sales and marketing organizations achieved, on average, a 32% year-over-year revenue growth; while their less aligned competitors saw a 7% decrease in revenue. Above the Funnel: Includes everything you do to create awareness for your company and products and to drive visitors to your website. 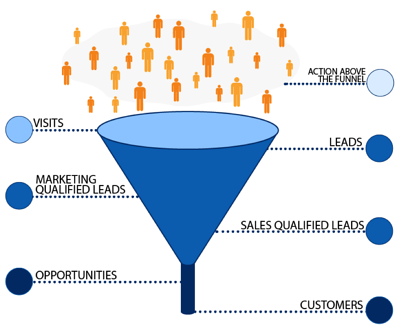 With some small exceptions, Above the Funnel should be “owned” by your marketing team. Top of the Funnel (TOFU): Once you’ve created some awareness, the focus turns to making it stick, creating alignment and turning visitors into leads. TOFU should also be owned by marketing, but your sales team needs to be involved in the strategy to ensure that it aligns with the bottom of the funnel and to provide the intelligence to build effective conversation paths. Middle of the Funnel (MOFU): Now that you’ve got people listening, the hard work begins. It’s critical that you have conversion paths in place that turn leads into Marketing Qualified Leads (MQL) and MQLs to Sales Qualified Leads (SQL). MOFU can be a little more complicated as both the sales and marketing functions have ownership of this process. It is critical that you align what you’re doing on the sales side with what you’re doing at the top of the middle of the funnel. Bottom of the Funnel (BOFU): SQLs need to be managed in order to be converted to opportunities and then to customers. BOFU is owned by your sales function and should be supported by the content your marketing team is creating. If you’re marketing efforts aren’t directly increasing closing rates, it’s a pretty good bet you don’t have an effective marketing function. By combining an effective strategy with a clearly defined process you’ll gain the leverage you need to build the sales momentum needed to accelerate growth, and to make the process of growing easier and easier.